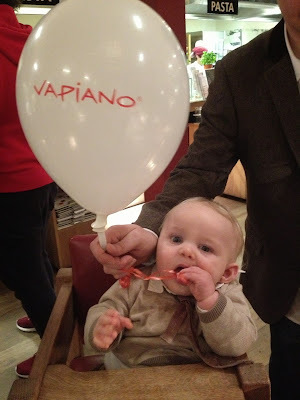 Last week, myself and Jon took ourselves off to London for the day with Tyne to review a new restaurant called Vapiano. Somewhere between the nicest of fast casual and hippest of casual dining restaurants is Vapiano. Defining the future of fresh casual - a new and refreshing niche in the restaurant industry - Vapiano is an innovative European concept serving made-to-order fire roasted pizzas, fresh, house-made pasta and hand tossed gourmet salads. An established concept with more than 30 worldwide locations and another 100 in development in the United States, Europe and the Middle East, Vapiano puts a new spin on the dining experience with its urban upscale Italian decor and its modern customer service. When we arrived outside Vapiano, I was worried that - after a day spent wandering around blustery London - we might be a little under dressed! From the outside the building looks modern and fresh, very on trend and somewhat upmarket. 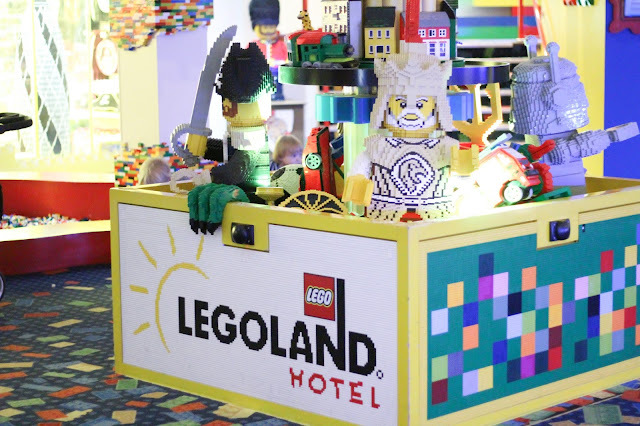 Once we went inside we were greeted by some very friendly staff who informed us that there were plenty of tables were available, and there was no need for reservations - so immediately I felt that it must be a little more informal than I had initially feared and I began to relax! Once we took our seats, the manager explained to us how the restaurant works - it is a little different from any restaurant I've been to before! Each member of a party is given a card each which looks like a credit card. 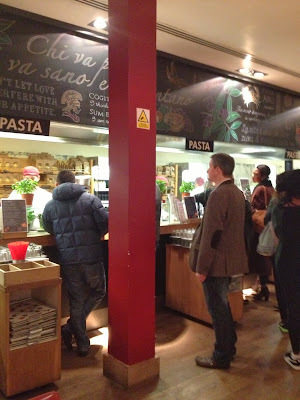 There are live stations all around with signs above them stating what can be ordered from them - there was a station for appetisers & salads, a station for Pizzas and a station for Pasta. People queue at the stations to order what they want, and then swipe their card so that it registers what they have had. Everything is cooked right in front of you, so you can see exactly what the chef is putting into the food - ideal for people with special diets as you can be 100% sure of what is in your meal as it is done right there in front of you! We decided to try some starters first. The starters were all ready to choose from, I chose the tomato bruschetta and Jon had the Carpaccio. 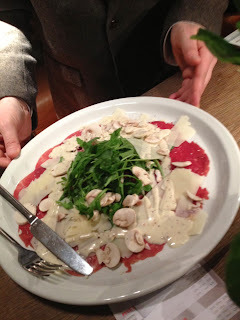 I wasn't brave enough to try Jon's starter as the thought of carpaccio doesn't appeal to me but it was presented very well and Jon polished off the lot which speaks volumes! 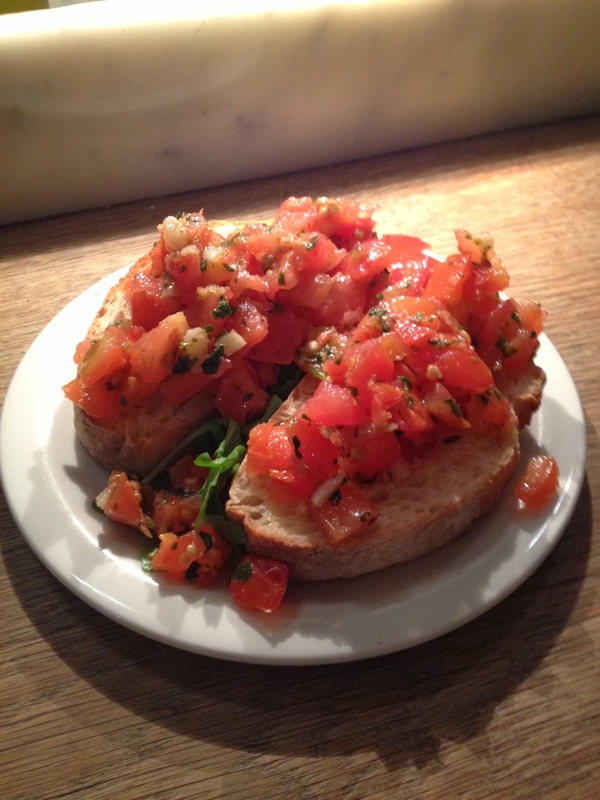 I have to admit that the bruschetta wasn't the best I have had, I like my bruschetta warm and the bread toasted and this was cold and the bread was quite chewy - not really what I was expecting. I had thought that we would have to order our starters and then queue again at the bar to order drinks but each and every food station also has a selection of drinks available, which was very handy! We then moved on to the main courses. 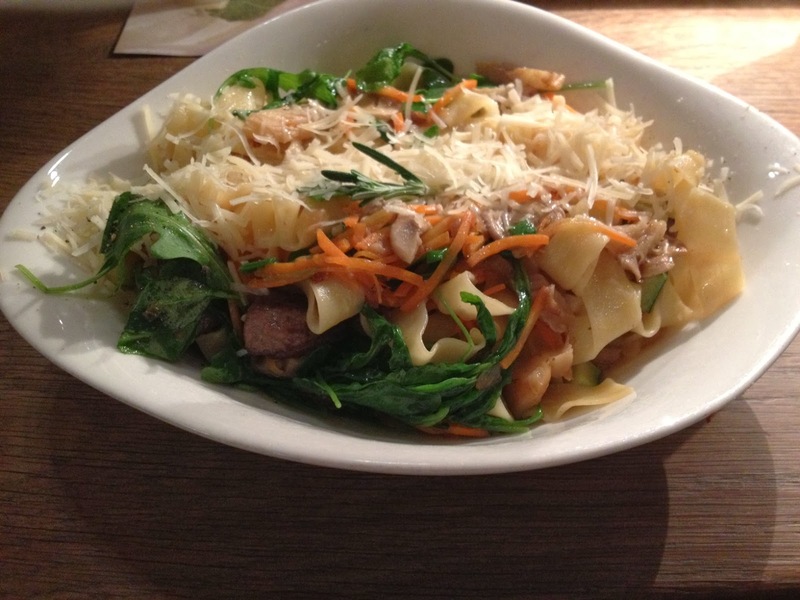 I went to the pasta station and asked the very helpful chef for the Filetto De manzo E Rucola with Tagliatelle - he told me this was a great choice, and I watched as he skilfully prepared my meal to order. He asked for my preference on how I would like the steak cooked, and whether I would like chillies. Whilst there, I asked him if there anything suitable for Tyne on the menu - he asked his age and told me that most of the foods have a lot of salt or chilli in them, but that he would happily make up a fresh tomato sauce for him! I thought this was really helpful and accommodating, and happily agreed. When ordering the pizza, you are given a pager to take back to your table so that you dont' need to stand around waiting. I've seen this done in the US before but never in the UK and I think its a great idea. Once Jon's Pager went off, he collected his huge pizza and we all tucked in! 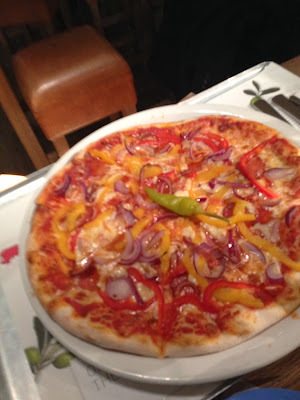 Jon's pizza was lovely and the ingrediants were very fresh. 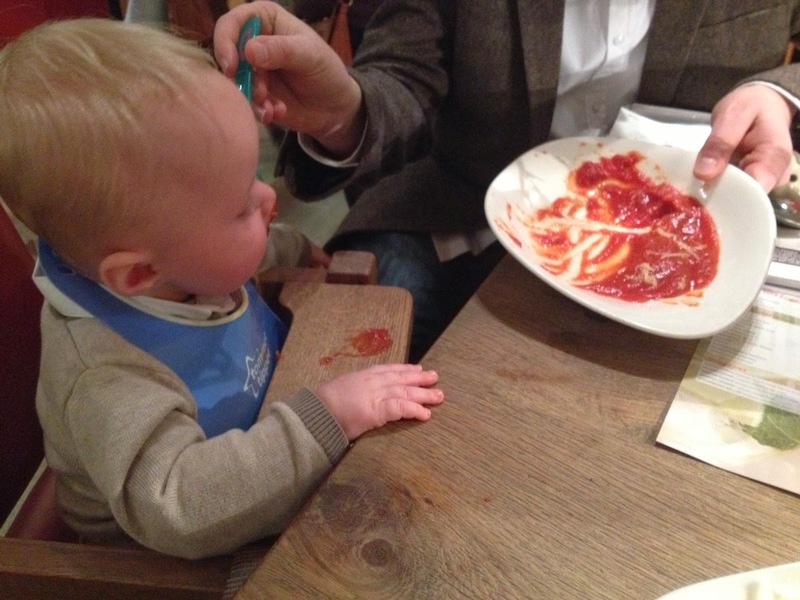 Tyne seemed to really enjoy his especially-created tomato sauce, and I ADORED my pasta dish! The beef was so tender with no fat at all, and the pasta was cooked perfectly al dente - the sauce had a lovely zing to it too! I could have eaten multiple bowls of it if only I wasn't so full! We then attempted dessert - we were both rather stuffed so we just shared some vanilla rice pudding between us. It was served cold, which I didn't think I would like, but it was absolutely divine! 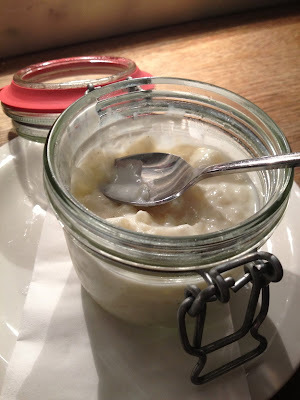 So creamy and moreish! The staff could not have been more accomodating during our visit - one of the female staff members came over to give Tyne a balloon and commented that he was "the most beautiful baby she'd ever seen" - yes perhaps she knew we were reviewing and was being extra nice who knows, but It still made me beam with pride! Everybody was so welcoming and even the other diners were very friendly. There was no snobbish attitude, none of the rushed-London feel you might expect - it was casual yet smart and trendy. Extremely clean, and very well thought out. 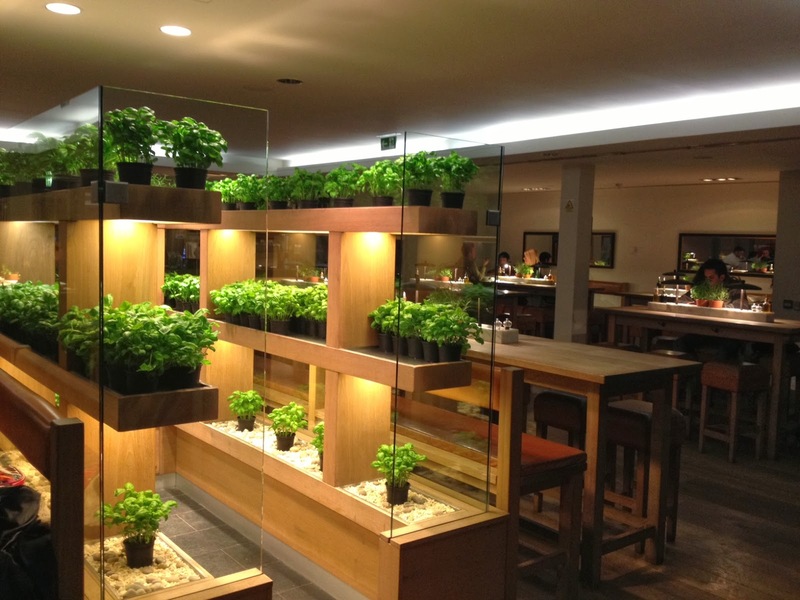 They have their own herb garden upstairs, which I thought was a fabulous idea! All in all, I was very impressed with my visit and I would not hesitate to call in again if we happen to be passing. 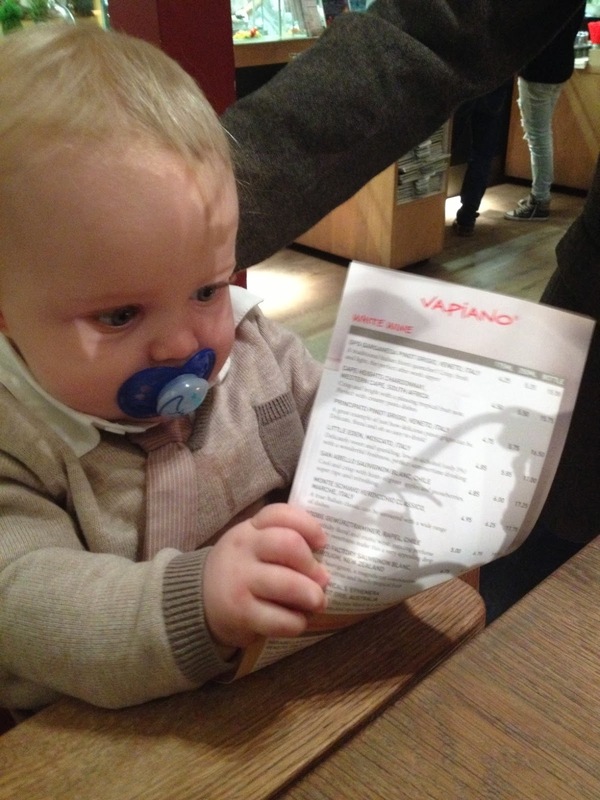 Have you ever tried Vapiano? As always, I'd love to hear from you! I didn't know they had Vapiano in London, too. I thought it was just all over the place in Germany. I love Vapiano. One of the best restaurants. The only thing is because it's so popular it gets crowded quite easily.